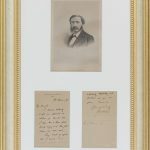 Autograph letter signed, 12mo., both sides, address printed as 15 Upper Hamilton Terrace, N.W., to K. Lehmann, esq., dated 10th December ’90; mounted in a frame with an engraved portrait of the author. Harte writes to say that he cannot accept an invitation for the 16th on account of a previous (and postponed) engagement. He asks that the recipient ‘pray accept my regrets that I cannot therefore partake of your kind and neighbourly hospitality, with Mr. Piete[?] and your other friends’.